I have occasionally been described as a bit of an “odd duck,” which Wiktionary defines as “an unusual person, especially an individual with an idiosyncratic personality or peculiar behavioral characteristics.” That definition certainly fits me (and most other wildlife photographers too, I suspect). In a more literal sense, “odd duck” is a great way to describe the unusual-looking Hooded Merganser duck (Lophodytes cucullatus). There are no other ducks in my area that look anything like these ducks, so identification is never a problem. Getting good photographs of one, though, can be a problem, because Hooded Mergansers are small and often skittish. 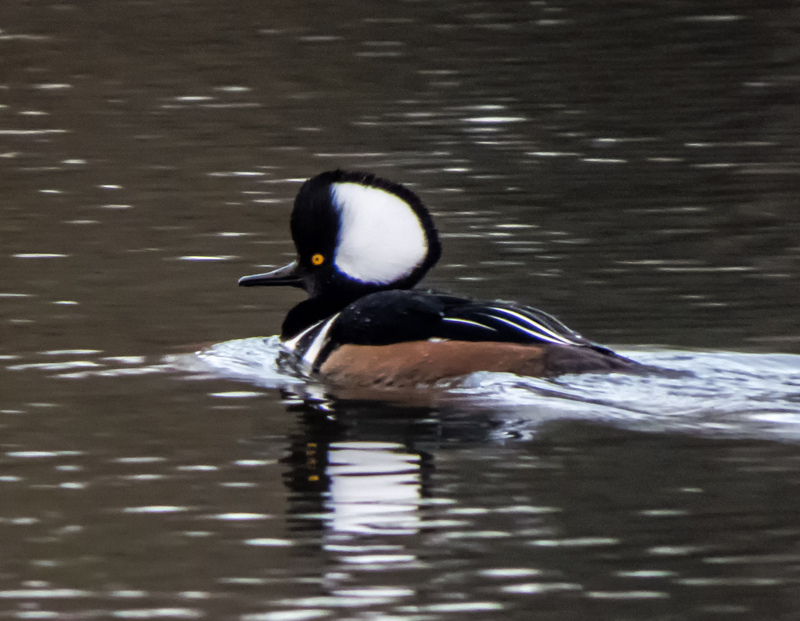 I spotted this handsome male Hooded Merganser yesterday at a suburban pond not far from where I live in Northern Virginia. He was part of a group of about a dozen or so Hooded Mergansers. Most of the members of the group were out in the middle of the pond, but this one hanging out nearer the shore and I was able to get off a few shots before he swam away to link up with the rest of his group. These are gorgeous! Such striking head! How very fortunate to have come upon a dozen hooded mergansers. That doesn’t happen too often. Your lucky day. And great that you knew to snap fast, because they don’t stick around near the shore. Fantastic photo, Mike, and much appreciated. Thanks, Jet. The mergansers may be migrating and just stopped by for a break. I’ll check tomorrow to see if they are still around (assuming today’s rain lets up). My favorite duck! Thank you for this lovely photo.